Some people say that nothing that comes out of a medicine bottle ever tastes good. Well, I would argue that is not always the case, especially when the bottle contains Strathisla 12 Year Old. Now, I’m not saying that whisky is medicinal (although my dad always had a glass if he felt a cold coming on), but the Strathisla 12 captures the look of a Victorian medicine bottle, with beautiful dark green glass, embossed lettering, several fonts, and a lovely etching of the distillery. Strathisla is owned by Chivas Brothers, makers of the well known range of Chivas Regal blends. According to the box the distillery itself is ‘The oldest distillery in the Highlands’, although we would debate this fact slightly. Not the age mind, but the location, because when you look on a map you would be forgiven for thinking that Strathisla is smack bang in Speyside. A sly Speyside imp certainly dances into the character of the Strathisla 12. The nose is light and sharp, with notes of hard fruit, grain, and crushed grass. The taste is crisp and green, with strong bitter herbal flavours that cut across the tongue, leaving a lasting dryness. There’s a raw, untamed edge to this Strathisla that suggests a younger whisky than its 12 years. Perhaps a few more years in the barrel would coax it into bloom. If you are one of those people that are of the opinion ‘It’s herbal, so it must be good for you’, then you will probably find a better bet in the Strathisla 12 than downing some concoction of random weeds pulled from the garden. The bitterness will definitely be a turnoff for some people, but sometimes that’s just what you want. In fact, come to think of it, the herbal qualities may even make it an excellent component for a cocktail. Take a walk into the leafy green garden of Strathisla and see if it’s just the tonic you’re looking for. 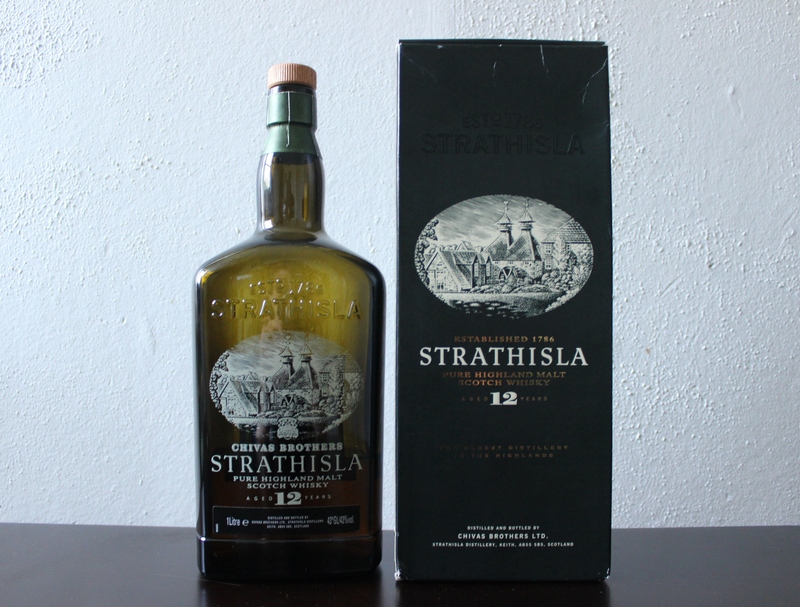 Quite like the Strathisla – decent dram for a reasonable price. Yeah, it’s not too bad really. My bottle was a duty-free one that I bought on a whim. Apparently the one I have is a discontinued bottling, so I’m not actually sure if it compares to what’s available now. how much does it cost this bottle?